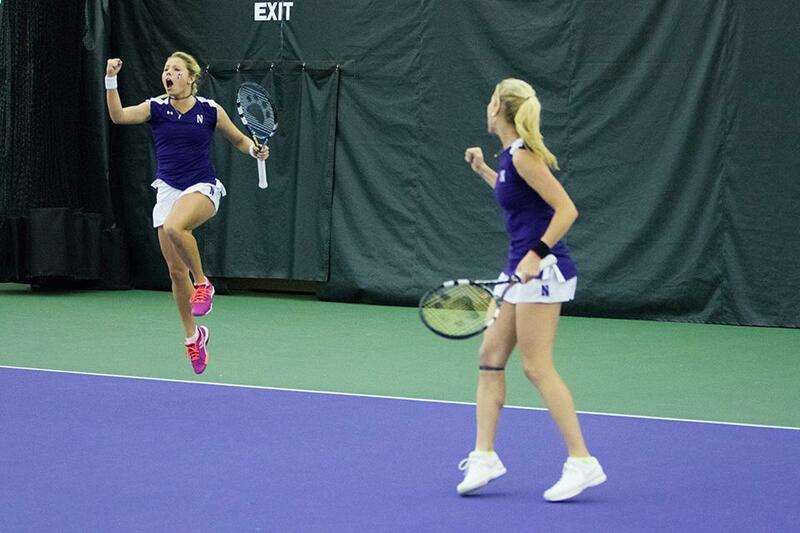 Alex Chatt (left) celebrates with partner Maddie Lipp after winning at No. 1 doubles Friday against Michigan. The Wildcats snapped the Wolverines’ 37-game Big Ten winning streak with the victory. Northwestern had its work cut out for it this weekend against rival Michigan. After their first conference loss last weekend, the Wildcats (12-9, 10-1 Big Ten) faced another tough foe in the No. 10 Wolverines (18-5, 10-1), but the Cats pulled out the victory 4-3. The doubles point, coupled with wins by juniors Jillian Rooney at No. 5 singles and Brooke Rischbieth at No. 6 singles, gave NU a quick 3-0 lead. After the initial burst, Michigan clawed its way back, tying the match at 3-3 after singles wins over Barnett and sophomores Alex Chatt and Erin Larner. Sophomore Maddie Lipp was the last Wildcat standing. After winning the first set in a tiebreak 7-6 and losing the second set 6-2, Lipp found herself down in the third set, 4-1. With the help of coach Claire Pollard, Lipp changed up her strategy based on the playing style of her opponent, the Wolverines’ Brienne Minor. Lipp started hitting lob shots to the back of the court and the minor change made a big impact on her game. Slowly, but surely, Lipp came back to take the set 6-4, giving NU the upset win. With Lipp’s finish, the Cats snapped the Wolverines’ 37-match, conference regular-season win streak. This win also marked the team’s first win over a top-10 opponent in more than three years. Pollard said the match was emotionally draining for NU, but especially for Barnett, who lost her match on the No. 3 singles court on Senior Day. For the senior, Michigan was an important opponent to beat. Barnett said she was proud of her team even when it looked like NU wasn’t going to pull out the win. After Friday’s win, the Cats took the fight to East Lansing, Michigan to face their final Big Ten regular season opponent, Michigan State. Since Pollard’s arrival to NU in 1998, the Cats had never lost to the Spartans, and after a dramatic finish Friday, NU went into the match with confidence. The Cats easily handled the Spartans 6-1. But Pollard said the win was not easy. With the weekend results, NU clinches the No. 2 seed going into the Big Ten Tournament next weekend, hosted at Michigan State.